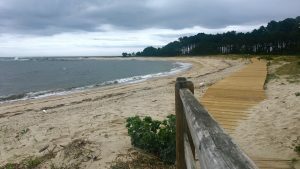 The Portuguese Camino or the Portuguese Coastal Camino? There are many pilgrims who get in contact with us to ask about the differences between the Portuguese Camino (the traditional one) and the Portuguese Coastal Camino. It is commonly said that there are as many routes as pilgrims walking them, and we want to help you to discover your own way. For this reason, we will talk about both routes in this post. 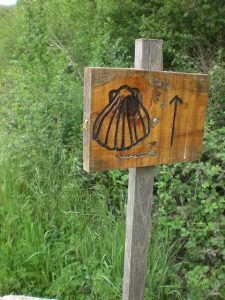 If you are thinking about walking any of the Portuguese routes on your way to Santiago de Compostela, just keep reading. You will discover all the attributes of both trails, so you can choose the best one for you, according to your preferences. The Portuguese Way is one of the most traditional routes of the Camino de Santiago. It was the second route in number of pilgrims in 2017, right after the French Way. Did you know that 59,235 arrived in Santiago de Compostela, and got their Pilgrim Certificate (Compostela) using this route? All this information was given by the Pilgrim’s Office by the end of the year. This route combines the sociable part of the Camino, but also offers moments of solitude, for reflection (and this is sometimes quite difficult on the French Way, at least during some periods of the year). The route is also known as Central Portuguese Way, because it is mostly an inland route. We can find the origin of this Camino on the XIV century, when the Queen Elizabeth of Portugal walked twice towards the tomb of the Saint James the Apostle. The news about the remains of the Saint being in Santiago, got spread through Europe very quickly. In fact, one of the most popular streets of the old quarter of Santiago de Compostela, is called Rúa da Raiña (Queen’s Street). It is a sort homage to the Queen Elizabeth of Portugal. A couple of years later, it was found in the Vatican a manuscript that states that the priest Juan Bautista Confalonieri did this route by horse, from Lisbon to Santiago de Compostela, in 1594. Since then a lot of works have been carried out in this route, to set it up; and nowadays, it is one of the most popular routes of the Camino. The trail covers two different countries, but with a lot of connections thanks to the Camino de Santiago. It is true that the French Way starts in St-Jean-Pied-de-Port (right in the border with Spain), but only the first stretch is in France. All the rest of the walking days are in Spain. The Portuguese Way departs from Lisbon. But the first sections of the walk are not the most popular ones (signposting aren’t great, the landscape is kind of urban with outskirts, and the terrain is irregular). 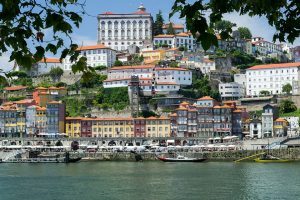 For this reason, most of the pilgrims decide to start in Porto, the second most popular city of Portugal. The walk from Porto passes through the last 200 km of the Portuguese Way, and you will be able to discover some of the most popular towns of Northern Portugal. This Camino is usually done in 12 walking days (and 13 nights). But if you do not have enough time to walk 200 km, you can choose to walk the last 100 km of the route (the minimum required to get the Pilgrim Certificate); that is, from Tui to Santiago. This can be completed within 6 walking days (and 7 nights). If you feel distances are too long, each walking day can be split in two. It is possible to sleep in the best accommodations on the way (Paradores, historical buildings, upgraded hotels…); see the Portuguese Way Lux. The Portuguese Coastal Way is a recent Jacobean route of the Camino. In fact, it was only declared an Official Route in April 2016 (together with the Winter Way). It is still quite unknown compared to other trails, but its landscapes are considered to be the best of the whole Camino, by many pilgrims. The terrain is not particularly challenging (compared to other routes). It is also known as the Camino Monacal (Monastic Way) because of the importance of the Monastery of Santa María de Oia, for those pilgrims of the XII century. In the Middle Ages, those pilgrims who walked the Portuguese Coastal Way, used to be the ones that arrived by boat into the coastal cities, such as Lisbon or Porto. 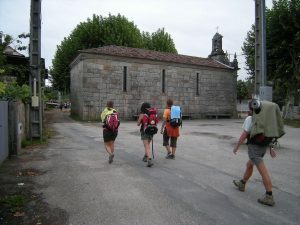 After reaching the coast, they continued walking towards Santiago de Compostela, following the sea line. The most outstanding attribute of this route, are the landscapes that you will be able to contemplate on the way to Santiago. If you love the sea and Portuguese and Galicia coast, the most important part of this journey will be the coastal views, the sunset, and the natural areas. The Portuguese Coastal Way can be start in Porto, or just the last 100 km, from Baiona to Santiago. You can stay in standard accommodation, or upgraded accommodation. Both routes share its medieval origins, and also the last section of the trail. Both of them pass through Porto, and finish in Santiago de Compostela. The follow a different path from Porto, but join together again in Redondela, sharing the same route until reaching Santiago. It is the second most popular city of popular, and declared a World Heritage Site by UNESCO in 1996. The wine from Porto is very well known, and the historical quarter of the city is a must. Pontesampaio is a small village that belongs to Pontevedra. It is popular because of its bridge, that is known as the Bridge of Pontesampaio, or the Roman Bridge of the Verdugo River. According to the legend, the bridge was crossed by Almanzor in 977, on his way to Santiago de Compostela. But it is mostly known because it was the bridge where the battle against France took place (the Battle of Pontesampaio, 7 and 9 of July, 1809). This battle meant the end of 5 months of French occupation, and is was a critical fact during the War of Spanish Independence against the French. Las tropas francesas habían perdido Vigo, Tui y Pontevedra, y se dirigían a atravesar el puente cuando las milicias populares los detuvieron e hicieron que se retirasen de Galicia. The historical quarter of Pontevedra is the second most popular of Galicia region, right after the streets of Santiago de Compostela. The Church of La Peregrina stands out in the centre of city. It as Baroque temple, the only circular church of all Spain. 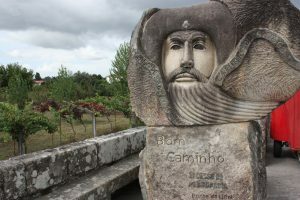 Here, the Pilgrim Virgin, welcomes all those pilgrims walking the Portuguese Camino (the traditional and the coastal route). The Barosa River Natural Park is located in Barro (Pontevedra). There are many cascades, mills, and streams. Its natural beauty is out of the question. Also, it is a great place if you are traveling with kids, as they can enjoy playing on the park. The sound of the Barosa River will make you enjoy all the relaxation and peace you need, right before resuming your walk. Padrón was the destination of Saint James the Apostle around year 34 after Christ, and it was the starting point of the Jacobean tradition of the Camino de Santiago. After the death of Saint James the Apostle in Israel, his remains were transported by boat to Padrón. After this, they were moved to the place where nowadays we can see the Cathedral of Santiago de Compostela. Padrón is also the hometown of two popular Galicia writers: Rosalía de Castro and Camilo José Cela. This small town is very well know because of its fruits and vegetables. The most popular one? The “Pimientos de Padrón” or Padrón peppers. The traditional Portuguese Way is an inland route, while the Portuguese Coastal Camino (as we can understand from the denomination of the route) follows the Portuguese and the Galician coast. The Portuguese way, is a traditional route (the second most chosen Camino), for this reason you will find more pilgrims on the way. On the other side, the Portuguese Coastal Camino is less known, if you are looking for a peaceful route, you will really enjoy it. One of the most iconic towns of the Portuguese Way, is Barcelos. When we visit a country, it is very usual to take a souvenir back home, for our friends and siblings. In Portugal, it is very common to see the small figure of the rooster. This symbol comes from the legend of the Rooster of Barcelos. According to it, a Galician pilgrim was walking from Barcelos to Santiago de Compostela, when we was accused of steeling money from a landowner. This pilgrims was condemned to the gallows, and his last will was talking to the judge. He was eating roasted chicken (rooster). The pilgrim stated that, as a prove of his innocence, the rooster would get up and start to sing. When the pilgrim was about to be hanged, the rooster stood up, and sang. The pilgrim was saved! 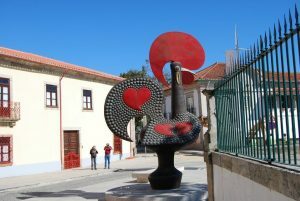 It is said that he came back to Barcelos a couple of years later, to built the statue of the Rooster of Barcelos (that we can visit nowadays the Archeological Museum of Barcelos). Also in Portugal, Ponte da Lima stands out because of its medieval bridge. It is considered to be one of the most spectacular ones of the country. It was built in the XIV century, and nowadays there are only five Roman arches preserved. Its streets, also medieval, are great for a pleasant walk. Just a bridge divides both countries, Portugal and Spain. To pass from Valença do Minho to Tui, you only need to cross the bridge, known as Puente Internacional de Tui (International Bridge of Tui). After Porto, the Portuguese Coastal Way follows a different path than the traditional one. 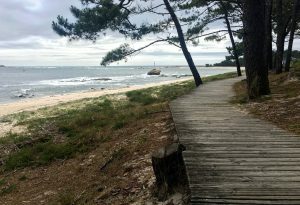 This path follows the coast line: Povoa de Varzim, Esposende, Viana do Castelo and Vila Praia de Áncora. 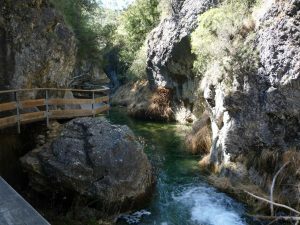 The trails follows spectacular views, wouldn’t you like to enjoy them? During the XVIII century, one of the most important fishing ports of Portugal was built in Povoa de Varzim. The beauty of the water and its beaches, turned this Portuguese town into the most popular tourist destination, both for nationals and international travelers. The beaches of Esponsende are the highlight of the region. This a natural protected area, with a wide diversity (both flora and fauna). From March to September, the area is full people practicing kitesurf (the conditions of the sea are perfect to practice this sport). The best part of the day: the sunset. One of the most popular dishes of Portugal is cod. Do not leave the country without trying it, because the way they cook it in Portugal is incredibly tasty! The port of Viana do Castelo has been one of the most popular spots to buy this fish. Portugual is very well known because of its amazing beaches, and we strongly believe this is true. What to you think? As we have previously mentioned on this blog, Baiona is the first port seen by the Caravel La Pinta, on the way back from the new continent. And it has its own museum. 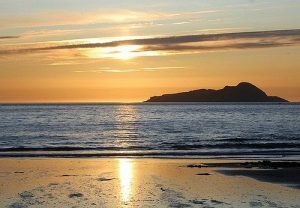 On the way to Vigo (the most populated town of Galicia) you will walk through the beaches of Nigrán, and will be able to see the shape of the Cíes Islands. We hope we have helped you discover your own way on the post! 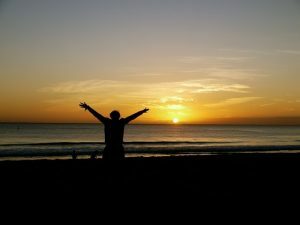 Whatever your decision is… Buen Camino! Do not hesitate to contact us if you have any questions at all!